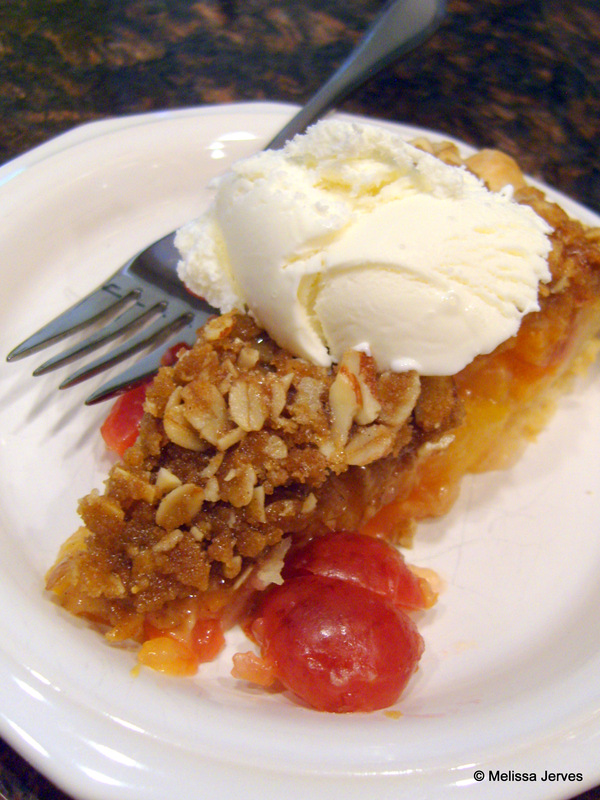 Mmmmm…Stone Fruit Pie with Almond Streusel from Food & Wine. This one has peaches, apricots, plums and cherries. 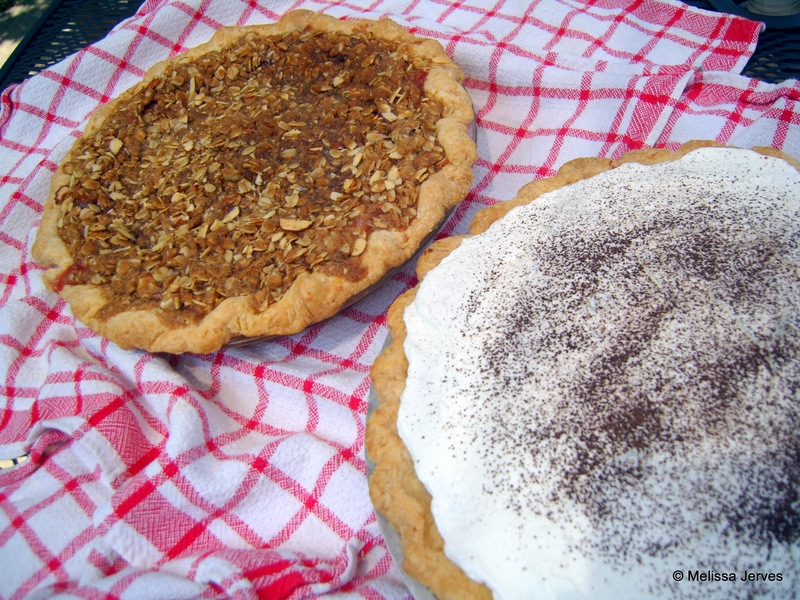 While he was at it, I asked him to double the crust recipe so I could make a Chocolate Cream Pie. Why have one pie when you can have two? WELL. The crust was a revelation! A REVELATION, I tell you! 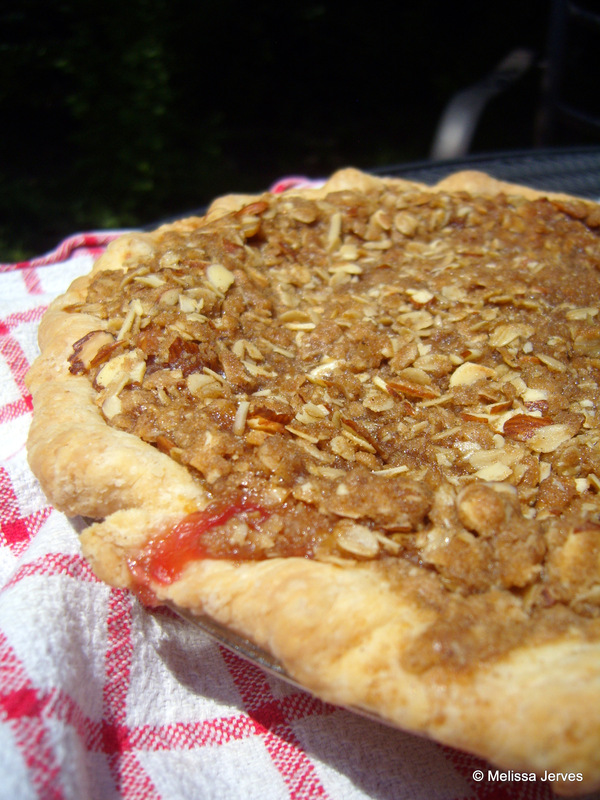 Flaky, tender, but also crisp and not a bit soggy under all that fruit and pudding. What was different? I did a little research. Rose Levy Berenbaum, trusted author of The Cake Bible and The Pie and Pastry Bible, writes in her own Basic Flaky Pie Crust Recipe that “baking powder lifts and aerates the dough slightly without weakening it, but it makes it seem more tender.” Whatever–it worked. That, and baking the pie in the lower third of the oven. The crust I blind-baked for the chocolate pie turned out well, too. I’ve had problems with the last couple crusts I’ve blind-baked–all sorts of shrinking and tough pastry horror stories. This time we remembered to refrigerate the dough overnight before rolling it out, and then froze the unbaked crust in the pan for 30 minutes before baking (with foil and pie weights). Cue the singing angels! I made this crust, at least I think I did, from the link yesterday. I made a three berry, double crust. I even followed the baking tips so my crust was perfectly brown and not over or under done. Only one drawback. The taste, not enough salt and it needed sugar. Did I miss something? Any suggestions? Two thoughts: The original recipe included a streusel topping, which had plenty of salt, so we didn’t miss it in the crust. I rarely put sugar in the crust, either, so didn’t miss it. Usually the filling is plenty sweet and I like the contrast. In any case, you could add a 1/4 tsp. of salt and maybe a Tbsp. of sugar to the crust if that’s what you like, and I expect it would still turn out well. But maybe your filling just needed to be sweeter? ← Monday Menu on Tuesday…plus recipes and projects you may have missed!